This brace is designed to give your knee excellent stability. You should expect this product to feel comfortable when worn while offering lateral, rotational and hyper-extension control to the knee. As well as retaining full freedom of natural joint movement ,with no restriction. The brace will support the ligaments in cases such as stretched or torn ACL or damaged MCL etc. The Mustang is a top of the line brace offering excellent support for active people when returning back to their chosen activity. With Unique nylon composite hinges provide mechanical lock-out before hyperextension of the knee occurs. Excellent lateral support, primarily designed to protect old injuries such as ACL, PCL, medial cruciate and collateral ligament conditions, it will help prevent new injuries. The Mustang is the top of the range brace for knee instability. Designed for *ACL, *PCL, *MCL, and *LCL tears and instabilities, also for use after ACL reconstruction. (*abbreviation guide see Below) A strong and stable brace, suitable for use in contact sports. This brace is designed to give your knee good stability. You should expect this product to feel comfortable when worn yet offering lateral, rotational and hyper-extension control to the knee. As well as retaining full freedom of natural joint movement, with no restriction. The brace will support the ligaments in cases such as stretched ACL causing mild instability or damaged MCL etc. The Pinto is a middle of the line brace offering good support for active people when returning back to their chosen activity. The Pinto brace is excellent for the support of mild instabilities of the knee, for situations of mild *ACL, *PCL instability and *LCL or *MCL tears. The added benefit of this particular brace is that it can provide support to users with patella (knee cap) problems providing extra control of the knee due to the open patella design. Unlike many other support braces available at present, the Pinto has removable hinges and thus can be used not only as a stand alone knee brace, but with the advantage of being used as a compressive support with the hinges removed. The Pinto is ideal for situations where some control of the knee is required against lateral, rotational and hyperextension. Can be worn as a preventative brace for activities such as Ski-ing and Motocross. (*abbreviation guide see Below). You should expect the Colt to feel comfortable when worn yet it will offer good support and compression to the knee and surrounding area, allowing full natural freedom of movement. Providing gentle medial / lateral support to painful knees. The Colt is designed to provide comfort to the knee by providing good compression and support. It is useful for people with tendonitis, slight meniscal tears, bursitis, arthritis, chondromalicia patella. The Padded Knee is designed to be comfortable when worn yet providing comfort to the knee and surrounding areas. It provides relief by compression and support. Eases aches & pains. Relief for minor sporting injuries and ailments commonly associated with, Patella Tendonitis / Osgood Schlatter’s Disease (OSD) / Bursitis / Rheumatic and Arthritic related knee conditions. Being of an internal open patella design the Padded Knee will also help to keep track of the knee cap through its natural plain during most activities. Fitted with an extra layer of neoprene around the knee cap area that provides, additional support and protection. A comfortable lightweight wrap over support, suitable for light strains, stiff and sore joints. Affords relief from aches and pains commonly associated with rheumatic and arthritic conditions. The Knee Strap is designed to be comfortable when worn while providing support and uniform compression to the areas below & surrounding the patella, plus stability and improved tracking to the patella. Eases aches & pains. To help in the prevention and treatment of Patella Tendonitis (jumpers or runners knee), Chondromalacia, Osgood Schlatter’s Disease (OSD), Patella Instability and other similar knee conditions. ACL :- Anterior Cruciate Ligament, The position of this ligament is in the centre of the knee and this connects the tibia to the femur and prevents the lower leg moving forward relative to the thigh. PCL :- Posterior Cruciate Ligament, The position of this ligament is in the centre of the knee and is crossed by the ACL ligament. MCL :- Medial Collateral Ligament, located on the inside of the knee. LCL :- Lateral Collateral Ligament, located on the outside of the knee. The lumbar back support is designed to provide excellent posture control and be comfortable when worn while providing good support and compression to the surrounding areas. Excellent for warm climate use. The belt is designed to aid posture control with compression and support yet is flexible, lightweight and comfortable to wear offering extra protection to soft tissue injuries. A wrap around design with simple hook closure allows ease of application together with infinite user adjustment supporting the lower back and kidney area. Manufactured from neoprene that stretches and contours to the shape of the body. This three in one padded back support brace is fitted with extra robust removable foam inserts and is designed to provide maximum support and cover, irrespective of individual lower back shape, one of our most multi functional supports. Can also be used to help provide extra protection to soft tissue injuries. Available in 2 neoprene versions, Standard or Floprene®. As a stand alone compressive support. The Kidney belt is designed to aid posture control with good compression yet providing lower back and kidney protection. A hi-tech lightweight sturdy and Slim Design that can easily be worn under clothing. Should for any reason the prospective purchaser be unsure in any way concerning the suitability of each individual support / brace product, we advise that they should first seek professional medical advise via your local practitioner or physiotherapists to ensure any treatable medical causes are identified. As our back support products are suitable for a variety of uses and as each case is an individual we have listed below some of the more general back problems that exist and can be used in conjunction with professional medical advise help in the selection of a specific product above should they be suitable. If you suddenly start feeling pain in your lower back or hip that radiates down from your buttock to the back of one thigh and into your leg, your problem may be a protruding disk in your lower spinal column pressing on the roots to your sciatic nerve. Sciatica (lumbar radiculopathy) may feel like a bad leg cramp that lasts for weeks before it goes away. You may have pain, especially when you sit, sneeze or cough. You may also feel weakness, “pins and needles” numbness, or a burning or tingling sensation down your leg. See a doctor to have your condition diagnosed and start a course of treatment. You’ve probably heard people say they have a “slipped” or “ruptured” disk in their neck or lower back. What they’re actually describing is a herniated disk, a common source of neck, or lower back and arm or leg pain. Low back pain affects four out of five people. Pain alone isn’t enough to recognize a herniated disk. See your doctor if back pain results from a fall or a blow to your back. The most common symptom of a herniated disk is sciatica-a sharp, often shooting pain that extends from the buttocks down the back of one leg. It is caused by pressure on the spinal nerve. To diagnose a herniated disk, give the doctor your complete medical history. Tell him or her if you have neck/back pain with gradually increasing arm/leg pain. Tell the doctor if you were injured. The doctor will physically examine you. This can determine which nerve roots are affected (and how seriously). A simple X-ray may show evidence of disk or degenerative spine changes. The lumbar spine (lower back) provides a foundation to carry the weight of the upper body. It also houses the nerves that control the lower body. With aging, the discs in the front of the spine become dehydrated. The joints in the back of the spine become overgrown due to arthritis. These degenerative changes are the result of the normal “wear-and-tear” associated with aging. Over time these changes can also lead to narrowing, or stenosis, of the spinal canal Narrowing of the lumbar spinal canal pinches the nerves that control muscle power and sensation in the legs. Sometimes the pinched nerves become inflamed and cause pain in the buttocks and/or legs. These changes also can diminish the ability of the spine to carry the load of the upper body. They can lead to the forward slippage of one vertebra on another. This slippage, called “degenerative spondylolisthesis,” can cause both back and leg pain. The most common X-ray identified cause of low back pain in adolescent athletes is a stress fracture in one of the bones (vertebrae) that make up the spinal column. Technically, this condition is called spondylolysis (spon-dee-low-lye-sis). It usually affects the fifth lumbar vertebra in the lower back, and much less commonly, the fourth lumbar vertebra. If the stress fracture weakens the bone so much that it is unable to maintain its proper position, the vertebra can start to shift out of place. This condition is called spondylolisthesis (spon-dee-low-lis-thee-sis). If too much slippage occurs, the bones may begin to press on nerves and surgery may be necessary to correct the condition. Initial treatment for spondylolysis is always conservative. The individual should take a break from the activities until symptoms go away, as they often do. Anti-inflammatory medications such as ibuprofen may help reduce back pain. Occasionally, a back brace and physical therapy may be recommended. In most cases, activities can be resumed gradually and there will be few complications or recurrences. Stretching and strengthening exercises for the back and abnormal muscles can help prevent future recurrences of pain. The following instructions apply to items containing Floprene & Standard Neoprene. Hand or machine wash in water below 40 Celsius. Mild detergent may be used. Do not store in temperatures exceeding 40 Celsius. Do not store under heavy compression. All Velcro straps where fitted should be reattached and connected so as not to become entangled. Can I wear these items whilst participating in water sport activities? Yes: Our range is designed to be worn during just about any activity, even fresh or salt water activities. Can I wash “Isogel” GEL inserts ? All ISOGEL shoe insert products have been specifically designed to be washed. Recommended wash instructions: hand wash only in warm water with a mild detergent. IsoGel is a soft shock absorbing gel belonging to a class of polymers called polyurethanes. Isogel’s specially blended formula polyurethane is called a visco elastic polymer. It combines superior cushioning with high elasticity and affords a softness that imitates human skin. With an elongation of almost 900% it provides un-paralleled shock absorption and vibration dampening properties. This semi-set gel’s softness whilst ensuring a high degree of user comfort is still strong enough to absorb impacts of up to hundreds of pounds per square inch. Further information about wrist supports. 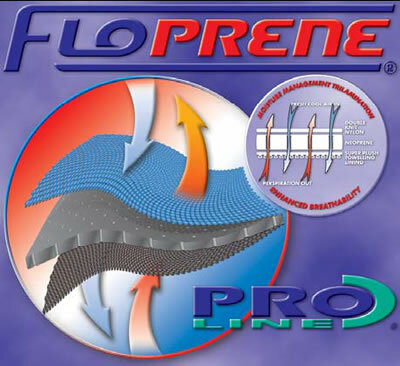 What is the difference between Standard Neoprene and Floprene® ? Both types of materials used in these products have a base material of neoprene which is a sponge rubber material which after repeated use will always return back to its original shape. The basic difference being is that for use up to 1- 2 hours our standard range is comfortable over this time frame. For extended use over 2 hours and for greater comfort over extended and varying climatic conditions our Floprene® range is highly recommended. Neoprene (Polychloroprene) is an extremely versatile synthetic rubber with almost seventy years of proven performance in a broad industry spectrum. Due to its excellent thermal properties and flexibility, Neoprene is used primarily in the sporting and medical industries. In the manufacture of Proline products, this high quality sponge rubber, laminated with a four way stretch fabric on its outer surface, is then inner lined with Super-plush towelling giving increased user comfort, and an excellent thermo-insulative barrier. Although you may see other companies offering similar products at lower prices, the chances are that they are using an inferior, industrial version that does not have the same thermal qualities or stretch ability. In the long term, this cheaper fabric degenerates, allowing the core material to break down into crumb. The outer lining is then likely to peel away. Proline products are manufactured using only the highest quality, genuine Neoprene. In fact we use only the best available raw materials, for all our merchandise. During the tri-lamination manufacture of Floprene® the inner lining material (Neoprene) is re-processed creating a series of small perforations within the inner lining prior to being laminated with its outer covering materials. This in effect creates a breathable thermal barrier between the body and atmosphere by having a double knit outer layer that breathes and an inner lining material of super plush towelling against the skin. The fine open weave fabric creates a micro-air gap between itself and the skin, aiding air circulation, yet still reflecting the body’s natural heat back into the surrounding tissue areas. The perforations allow excess moisture to escape and take in cooling air. The main advantage of Floprene® is that during long periods of wear or strenuous activities the core perforation system opens and closes during movement, helping to circulate air, while affording a good all round comfort factor. Another advantage is that Floprene® is suitable for use in varying climatic conditions. Floprene® and Standard Neoprene contain a synthetic rubber known as Neoprene (polychloroprene). It has been recognised that Neoprene has the potential to cause possible irritation allergic type skin reactions. If you have previously experienced such a reaction to Neoprene, you should not wear these products. If when wearing this product you experience an itching skin rash, or irritation the product should be removed immediately and you should consult a medical practitioner.